If images are more your thing than words, then please take a look through the photo gallery below and see how I can help you capture the romance and individual style of this remarkable city and make it your own. Greetings from Paris! I am Shantha. The one behind the camera, taking you around this stunning city as your experienced Paris photographer. I'm the photographer for super loved up couples and sassy individuals looking to make their visit to Paris memorable. More about me here and if you’d like to know what it is like working with me, my clients have kindly tooted my horn on Google, Yelp and here on my virtual home. I am a believer that when you do small things with great love, it means something, it creates memories and nolstagia, it makes purpose happen, little by little. My inspiration for making beautiful photographs not only comes from the old world slow life charm of Paris, but from favourite moments during a photoshoot such as the impromptu kisses and snuggles, a fleeting moment reflected in soulful eyes and hearty laughs. I am also inspired by clients who are easy going, warm and enthusiastic about making their Paris photo session with me an awesome, sweet and romantic experience. If these all sound good to you, then please get in touch. I would be delighted to hear from you. Digitally or in print, photos help you relive and reminisce over stories of how you have lived, travelled the world, and celebrated each juncture of your life. Photos are tangible and can be flicked through as many times as you want for your own reflection, amusement, sharing with the ones you love and eventually something which will be passed on as an heirloom to beloved family members. Therefore, choosing a Paris photographer whose story-telling vision is aligned to yours is paramount to having elegant, timeless and soulful photos that defy time. A well-aged city that is both poetic and charming in her architectural prowess. She has the power to induce old school romance into anyone whether that be lovers or your own good self. You have to agree that a photo session is just necessary when in Paris and I am sure that you can understand why. Everywhere you look (literally), whether it be back streets, side streets or big boulevards, there are stone wall carvings, intricate curly wrought iron railings, cobbled stone streets and monuments - all enticing to the eyes, heart and soul. Even the lamp posts have a romanticism to them. This is one of the reasons why I turned my passion for photography into a profession when I relocated to Paris from London. As your Paris photographer, I can capture special snippets of your life beautifully, be it a surprise proposal, engagement, pre-wedding, intimate elopement, honeymoon, wedding anniversary celebration or a special treat for yourself. 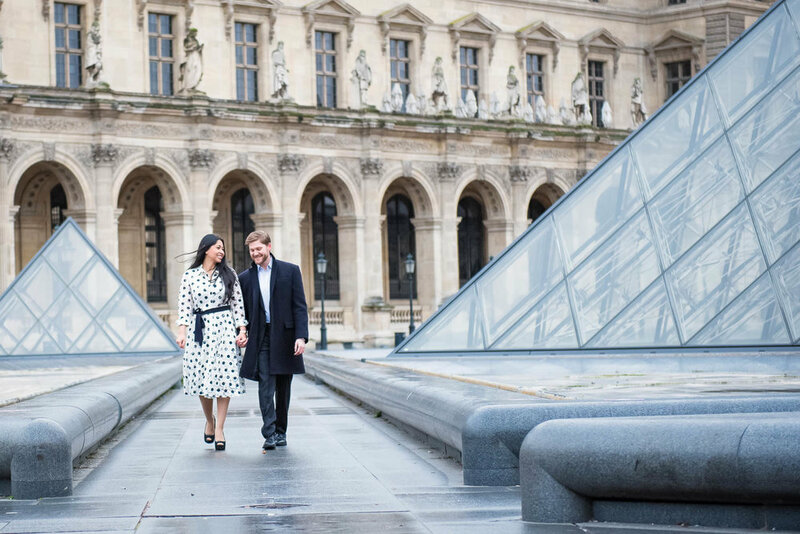 Your Parisian photo session can be tailored according to what you have in mind. I can make suggestions or we can hatch ideas together. You can choose your own locations or leave it to me to plan for you. Either way, I'll ensure that the process of booking and executing your Paris photo session with me feels effortless. I hope I've resonated with you, if so, I'd love to hear from you! You are looking for that perfect Paris photographer who could capture the essence of your love or who you are just as is. No fuss, no fluff. Just the two of you lost in the moment of making that romantic photo album. Yes, even for you, the individual. Because you know every moment you have is fleeting, never the same twice especially in Paris. And you know that by the end of your photo session, you would have beautiful photographs to mark the milestones of your lives. So you look on the internet and shortlist a few Paris photographers for their style of photography you love. Then you make your enquiries for their availability, pricing and packages. Then what? What should you be looking for when planning your international photoshoot, hiring a photographer you are not meeting beforehand, in a city you are not familiar with? Trust. Rapport. Comfort. Communication. Feelings. These are the things we consciously or unconsciously look for in a person we would like to work with. My approach is warm and easy going, giving gentle guidance in posing as much as you need or taking as many steps back as required if you are someone who needs your space. I can go on and tell you what you can expect in working with me or let my clients do it. After all, hearing from others whom have had the experience of working with me makes it more valid, would you not agree? Below are three ways of reading what it is like to have me as your Paris photographer, in the words of my beloved clients. I am limiting my number of bookings per week so that my caring and warm approach with you are consistent and the post processing quality of your photographs are not compromised from being rushed. Working from a place of calm and joy also ensures that you have a fun and pleasant experience in your Parisian photo session with me.